Wifredo Lam grew up in Cuba with a grandmother who practised Voodoo rituals and came of age in Spain (which he left after the fall of the Republican government to Franco's armies) and Paris, where he and Picasso became very close friends and artistic associates. In 1939 he joined the Surrealists and he collaborated on a book, Fata Morgana, with André Breton, who wrote the text that accompanied Lam's drawings. 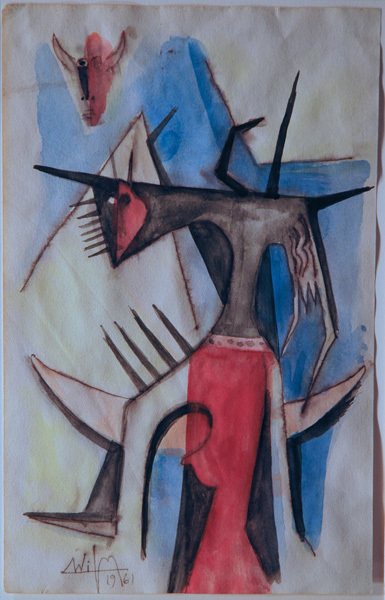 Sebastia Gasch in Wifredo Lam à Paris (Barcelona: Ediciones Poligrafa, c. 1976) suggests that "Lam might be considered as something like the indispensable link between the native forces of Americawhere we find the frenzied rites that originally came from Africa superimposed upon memories of the Amerindian civilizationsand the tradition of western culture." He further argues that "Lam's paintings evoke jungle landscapes and totemsthose beings, animate or inanimate, but generally in animal or plant form, from which the Indians of North America believe each tribe to descend. Thus his works may be said to give off an atmosphere of the legendary. . . . 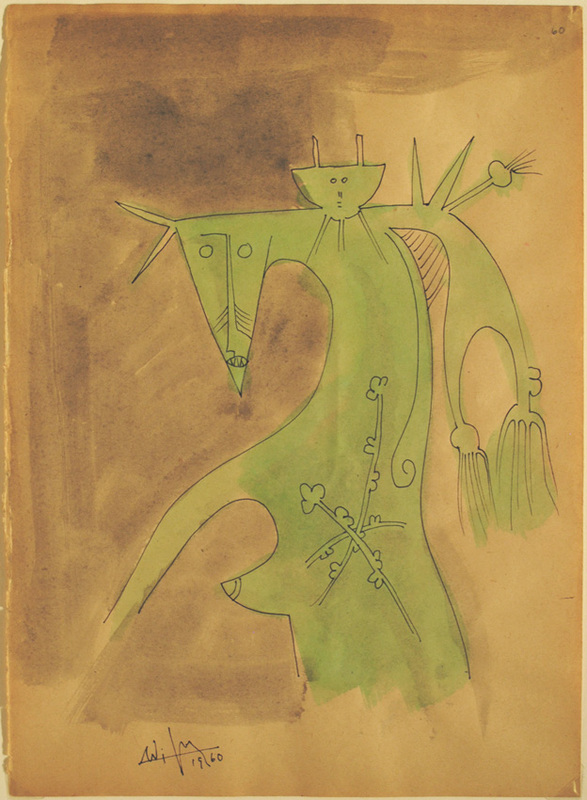 In a word, Wifredo Lam brings the terrible orchard to flower in jungles in which the civilized man and the savage are reconciled in a common seeking after truth" (p. 49). After the Germans invaded France, Lam left Europe on the same ship as Breton and Masson, helped in part by the International Rescue Committee, in token of which, many years later, Lam contributed a lithograph to the Flight Portfolio as a fundraiser. Returning to Cuba, Lam's work continued to mix Afro-Cuban and European influences. After the war, Lam travelled before finally settling in Paris, with side trips to Italy. Where Picasso and the German Expressionists turned to African art to revitalize European traditions, Lam combines these traditions not as an outsider but as a rightful possessor of both. His art offers the fantastic images of a living but alien tradition to a world needing to find a new conception of the civilized. 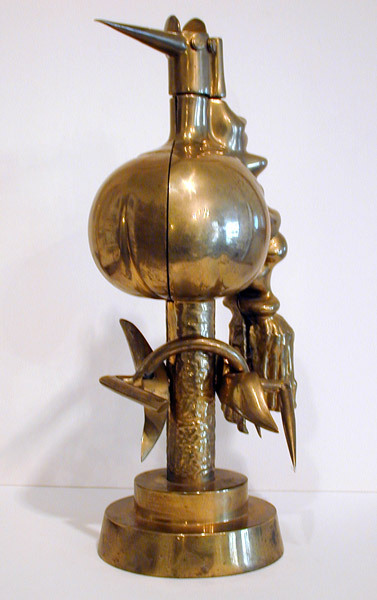 As Pierre Loeb, Lam's dealer from 1946 on, said, "Inspired by Picasso, to whom he owes not so much his style as a spirit of liberation and the boldness of expression deriving from superb craftsmanship, Lam introduces into the framework of western classicism the attributes of tropical magic and poetry. For three years I have watched him live and work, witnessed the birth of a work that becomes more legible and more mysterious each passing day. More legible pictorially and more mysterious intellectually, because there are no familiar images for us to relate to. 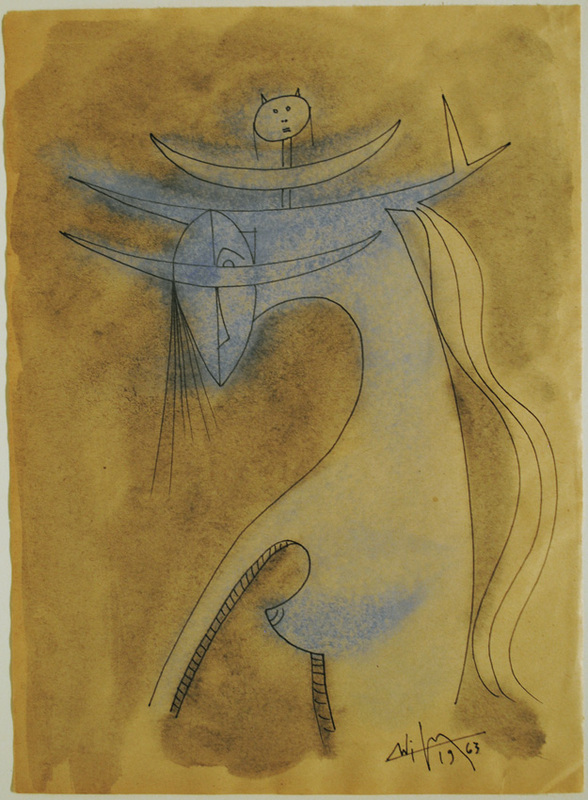 Even when we recognize a form from the past, it is mingled with so many other forms that we are really in the presence of a work that is difficult to relate to any previous one" (quoted from Max-Pol Fouchet, Wifredo Lam. Trans. Kenneth Lyons and Richard-Lewis Rees. 2nd Ed. [Barcelona: Ediciones Poligrafa, 1989], p. 204). Lam's works are to be found in many important collections of modern art including the Museum of Modern Art and the Guggenheim Museum (NYC) and the Tate; his works have been shown at major museums and important galleries in New York, Paris, Düsseldorf, Madrid (the Reina Sofia), Barcelona (the Fondation Miró), The Art Institute (Chicago), the Musée d'Art Moderne de la Ville de Paris, the Carnegie Institute (Pittsburgh), the Kassel Documenta (1959, 1960, 1965), the Stedelijk Museum (Amsterdam), the Venice Biennale (1972), the Museo de Arte Moderno (Mexico), the National Museum of Modern Art (Tokyo), and many others. Since his death, there has been an emerging consensus that Lam is one of the most important artists of the 20th century. Bibliography: General works: Maria R. Balderrama, Wifredo Lam and his Contemporaries 1938-1952 (NY: Studio Museum in Harlem, 1992); Bronx Museum of the Arts, The Latin American Spirit: Art and Artists in the United States, 1920-1970 ( NY: Abrams," 1988); Catherine David, Wifredo Lam (Paris: Galerie Lelong, 1991);Valerie Fletcher, Crosscurrents of Modernism: Four Latin American Pioneers. Diego Rivera, Joaquin Torres-Garcia, Wifredo Lam, Matta (Washington, D.C.: Hirshhorn Museum, 1992); Max-Pol Fouchet, Wifredo Lam. Trans. Kenneth Lyons and Richard-Lewis Rees. 2nd Ed. 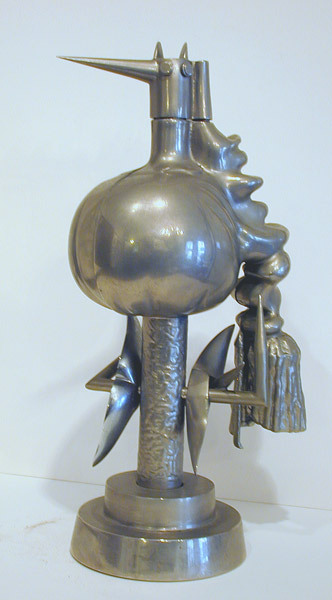 (Barcelona: Ediciones Poligrafa, 1989); Pierre Gaudibert et al, Wifredo Lam (Düsseldorf: Kunstsammlung Nordheim-Westfalen, 1988); Pontus Hulten, Wifredo Lam (Stockholm: Moderna Museet, 1967); Ulrich Krempel, Wifredo Lam (Paris: Galerie Lelong, 1988); Michel Leiris., Wifredo Lam (NY: Harry N. Abrams, Inc. 1970); Michel Leiris et al, Wifredo Lam 1902-1982 (Paris: Musée d'Art Moderne de la Ville de Paris, 1983); Wifredo Laurin-Lam, Wifredo Lam: Catalogue Raisonne of the Painted Work Volume I: 1923-1960 (Lausanne: Acatus, 1996); Ministerio de la Cultura de Espana Y Ministerio de la Cultura de Cuba, Homenaje a Wifredo Lam 1902-1982 (Madrid, 1982; catalogue to accompany the retrospective exhibition at the Museo Nacional de Arte Contemporáneo, Madrid, the Musée d'Art Moderne de la Ville de Paris, and the Musée d'Ixelles, Bruxelles); Centro del Arte Reina Sofia, Wifredo Lam (Madrid: Centro del Arte Reina Sofia, 1992); Lowery Stokes Sims, Wifredo Lam and the International Avant-garde, 1923-1982 (Austin: University of Texas Press, 2002); Philippe Soupault, Wifredo Lam: Dessins (Dutrou: Editions Galilee, 1975); Patrick Waldberg, Wifredo Lam (Amsterdam: Stedelijk Museum, 1967). 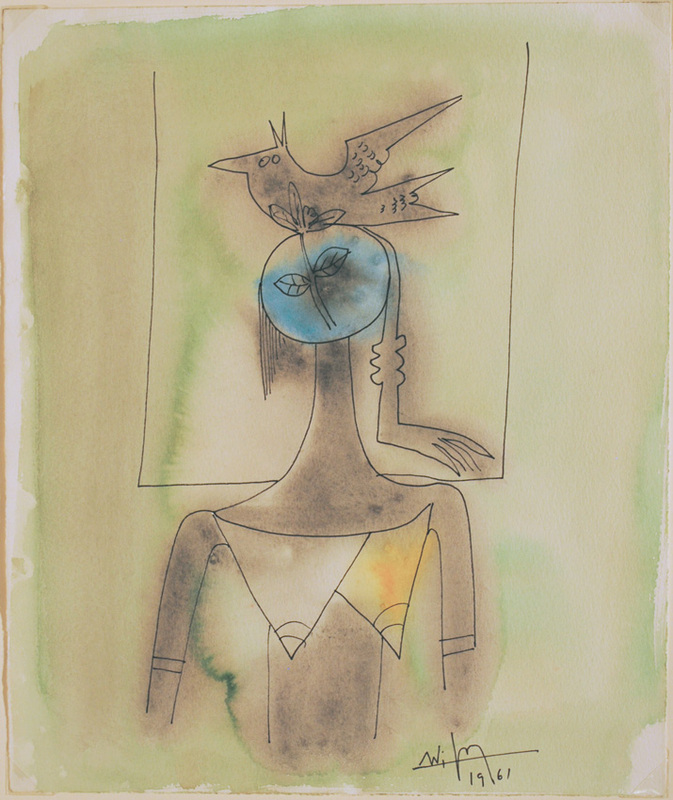 Prints: Dominique Tonneau-Ryckelynck, Wifredo Lam: Oeuvre gravé et lithographie. Catalogue raisonné. (Gravelines: Musée de Gravelines, 1994). Personnage. Original watercolor, ink, and wash, signed and dated 1960 in black ink lower left and "60" upper right. A strong painting of a woman whose human body has another superimposed upon it where her shoulders might be expected as well as branches growing on or within her chest. This merging of different physical and spiritual configurations is perhaps an inheritance from his growth in a culture permeated by memories of older religious traditions. Image size: 373x268mm. Price: $15,000. Woman with dove. Original watercolor, ink, and wash, signed and dated 1961 in black ink lower left. Like Picasso in the early 1950s (see, for example, some of Picasso's 1951 lithographs like M. 202, M. 203, and M. 210-215), Lam in the early 1960s seems to have felt that a reminder about the virtues of peace might not be out of line. W. H. Auden had written in his great poem "September 1939," as World War II broke out, "We must love one another or die"; in the era of nuclear threats, the message may have seemed even more urgent to Lam. The dove, carrying the branch that it brought back to Noah to tell him that God's anger had ceased and life was again becoming possible, holds the branch in such a way that it becomes the face of the woman (Peace? Concord?) on whose head it seems to be resting. Image size: 276x230mm. Price: $12,500. Personnage. Original watercolor, ink, and wash, signed and dated 1963 in black ink lower left. A strong painting of a woman with long, flowing hair and whose body is shielded by a pair of horn-like structures that echo the body of the cat-like spirit-creature either above or growing out of her own. Image size: 326x239mm. Price: $12,500. Untitled. Original watercolor, signed and dated 1961 in pencil lower left. A strong painting of a woman with a bull's head behind her, perhaps a reference to the myth of Pasiphae, wife to King Minos of Crete, who fell in love with a bull that subsequently fathered her child, the half-human, half bull Minotaur. Since the Minotaur figures prominently in a number of Picasso's works from the 1930s, it thus becomes a kind of hommage à Picasso. Image size: 227x143mm. Price: SOLD. 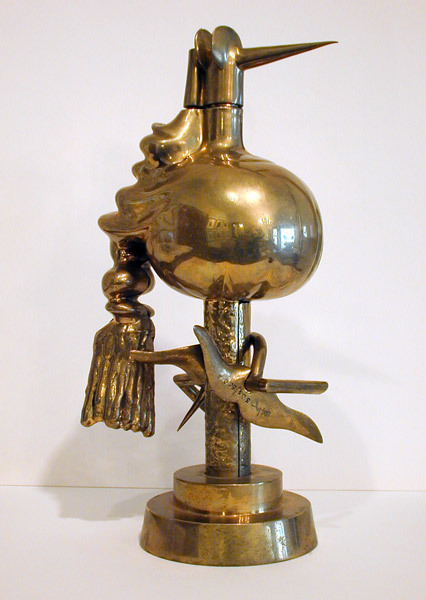 Pájaro de Oro. Original bronze multiple. 500 sculptures, each incised with Lam's signature and the edition number. Height: 235mm. Price: SOLD. 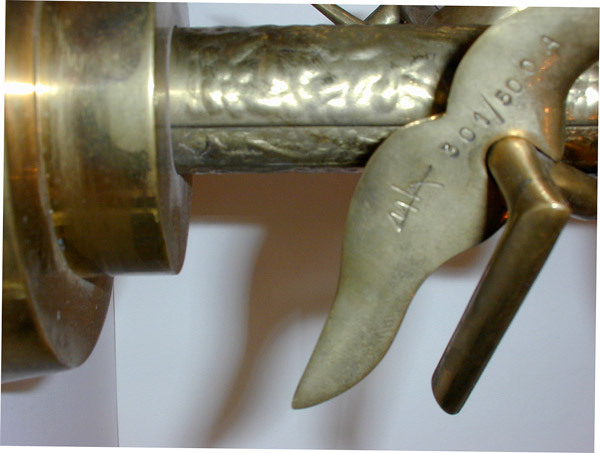 Pájaro de Oro (detail: signature plate). Original bronze multiple. 500 sculptures, each incised with Lam's signature and the edition number. Height: 235mm / 9.25 inches (includes base). Price: SOLD. 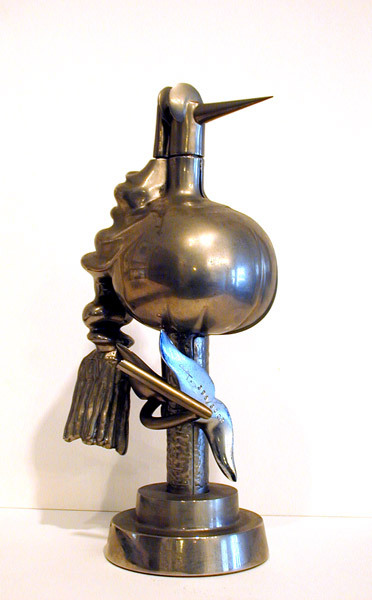 Pájaro de Plateado. Original bronze multiple. 500 sculptures, each incised with Lam's signature and the edition number. Height: 235mm. Price: $6250. 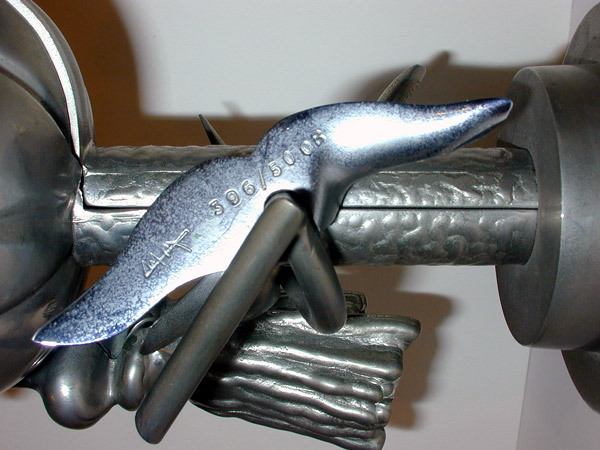 Pájaro de Plateado (detail: signature plate). Original bronze multiple. 500 sculptures, each incised with Lam's signature and the edition number. Height: 235mm / 9.25 inches (includes base). Price: $6250.